On Nov. 1, at the conclusion of the funeral for Raed Jaradat, who carried out the Oct. 26 stabbing attack in Beit Hanoun, an event took place that astounded those in attendance. Jaradat’s father turned to the father of Dania Arshid, the teenager shot a few days earlier after trying to stab an Israeli soldier at the Cave of the Patriarchs in Hebron, and on behalf of his dead son, he asked for the daughter’s hand in marriage. Arshid had been buried the day before, but that did not stop her father from accepting on the spot. The two men kissed, and the audience cheered. The funeral turned into a bizarre wedding of “shahids” (martyrs). This event is an example of the comeback “shahada” (martyrdom) has made in Palestinian Authority (PA) territories. After the end of the second intifada, in 2005, its presence in the Palestinian discourse decreased considerably. Now, however, it seems to have resurfaced to play an important role in the recent wave of violence. Jaradat’s funeral in the highly volatile city of Hebron took place after Israel, rejecting a measure supported by the Security Cabinet, began turning over to the PA the bodies of Palestinians who had perpetrated terror attacks in the past month. Senior officials from the Israel Defense Forces (IDF) supported their delivery, believing that it would calm tensions between the two sides while also reducing the motivation to kidnap Israeli soldiers as a bargaining chip in return for the bodies. In contrast, Shin Bet Director Yoram Cohen opposed the return of the bodies, fearing that their burial could result in violent flash points. 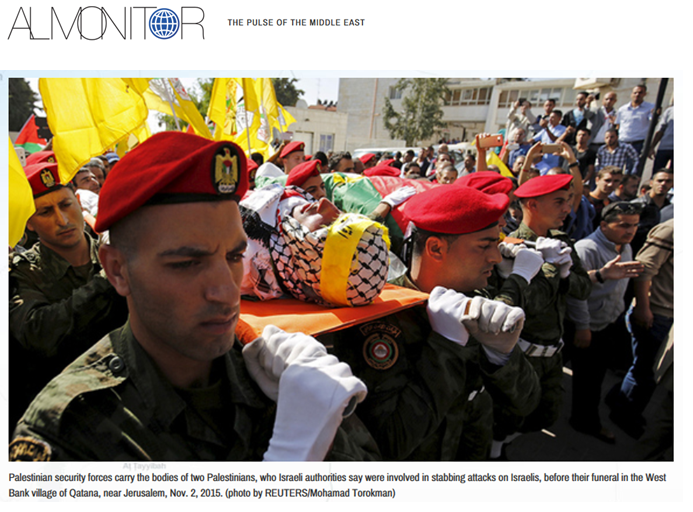 So far the funerals have not escalated into violence with the IDF. They have, however, turned into a kind of ceremony aimed at encouraging martyrdom via terror attacks. The mourners joyfully and loudly chant that the shahid is God’s favorite child. Interspersed with Islamic motifs, nationalistic songs exalt the choice to die as martyrs, promising them a life of eternity and bliss in the afterworld. Such messages are also routinely conveyed in the mosques, as well as in videos that flood social media and through radio broadcasts on Palestinian stations. This is the same atmosphere that coaxed and persuaded young men and women to carry out suicide bombings in Israel during the second intifada, between 2000 and 2005. Back then, accepting youths received the blessing of Palestinian clergy, chief among them Hamas leader Sheikh Ahmed Yassin, whom Israel killed in 2004. Muslim clergy in PA territories, the Gaza Strip and even beyond these areas issued fatwas (religious edicts) ascribing heroic and justified characteristics to suicide bombings against Israel. The general message, on which every young Palestinian was raised back in those years, was that anyone joining the armed struggle against Israel and carrying out a suicide attack would have eternal life, be considered a national and religious hero, and have 72 virgins awaiting them in paradise. These promises worked like a charm. School children even sent letters to Hamas leaders expressing their desire to be part of the “shahada machine” that promised them a life better than what they had on earth. After Israel killed Sheikh Yassin and another Hamas leader, Abdel Aziz al-Rantissi, in April 2004, Hamas, led by Khaled Meshaal, opted for a political path. Running in PA general elections, it decided to stop suicide bombings in Israel. What also dropped dramatically, although it did not completely disappear from daily Palestinian discourse, was the encouragement of martyrdom. Occasionally Hamas television and radio broadcasts, including those aimed at children and youths, presented martyrdom as something to aspire to. In a video posted to the Internet in July 2015, Sheikh Khaled al-Maghrabi is seen preaching to children in a summer camp at Al-Aqsa Mosque, telling them that virgins in paradise awaited the shahid. Since the beginning of the recent wave of terror in October, such discourse has made a strong comeback. What began as a campaign to defend Al-Aqsa and turned into young people carrying out attacks in Israel to bring about a change in Palestinians’ economic, social and diplomatic status then became a religious-oriented wave of terror. Yet when Palestinians follow this martyrdom script, they do so not only out of religious belief but also out of national pride, which comes with materialistic benefits on the side. A shahid and his or her family are guaranteed elevated standing in Palestinian society. The family gets a monthly allowance from the PA and organizations such as Hamas, Islamic Jihad and Islamic charities. As PA president, Mahmoud Abbas, who is trying to stop the recent wave of terror, gives family members of a suicide bomber financial support for the rest of their lives. This assistance is construed as a clear message in support of the terrorists’ actions. Five weeks have passed since the outbreak of the violence. Meanwhile, no Palestinian organization has organized attacks under its wings, but the theme of martyrdom is flowing through Palestinian society, and it could draw more and more young people into a snowball that will be hard to stop. Israel’s attempt to calm the atmosphere by giving the attackers’ bodies to the PA will not make the aura of the shahada disappear. This, in turn, raises further questions about the way Israel is handling the wave of violence. When it began, with Palestinians armed with a gun or knife bent on carrying out an attack, the prevailing attitude in Israel was that such an incident had to end with the killing of the assailant, even if he or she could have been stopped without deadly force. The objective was to use death as a deterrence to dissuade future attacks. It is now clear that this approach was misguided. Not only did killing the attackers not deter other Palestinians, it actually encouraged more to follow in their footsteps.